Ninety-seven years ago, Earth was devastated by a nuclear apocalypse, with the only survivors being the inhabitants of orbiting space stations at the time. Three generations later, resources are running out. Taking ruthless steps to ensure their future, a group of 100 juvenile prisoners are exiled to the Earth’s surface to test whether it’s habitable. No one has set foot on the planet until now. THE REVIEW: One of my favorite television shows of all time is Battlestar Galactica (the reimagined series from 2004, not the 1978 series). I’ve seen it more times than I can count now and I usually rewatch it once every year or so. When I first saw a glimpse of The 100 back in May during this year’s 48 Hour Film Project, my first reaction was that the show’s premise and aesthetic had strong ties to BSG not to mention, many of the supporting actors are alums of the Syfy (née Sci-Fi Channel) show. While it would be unfair for me to judge The 100 solely in comparison to Battlestar Galactica, I think the similarities are worth noting, and in most cases, explain why I enjoy The 100 so much. At the heart of both shows is a simple premise and a situation that I almost universally love: an apocalyptic world, very few remaining survivors, and a limited number of locations. All three of these criteria impose necessary restrictions on the storytelling and, in my opinion, create several interesting developments that you’d otherwise never run across with limitless possibilities of exploring the entire Earth or the ability to travel to foreign worlds when the story starts getting dull. The 100 handles these challenges deftly and populates the worlds of the Ark and the ground (i.e. Earth) with characters and situations that quickly rope you in. On the Ark, the remaining population (around 3,000 people, much less than the 50,000 at the start of BSG) is faced with an impossible task of trying to solve the problem of their diminishing life-support system. Part one is ridding the massive space-station of 100 prisoners — all kids who are set to be floated (executed) once they turn 18 — and sending them to the supposedly inhospitable ground of Earth (which was destroyed due to nuclear war). A lot of drama and politics ensues on the Ark between Chancellor Jaha (Isaiah Washington), Counselor Cain (Henry Ian Cusick) who is second-in-command, and Counselor Abby Griffin (Paige Turco). Down on the ground, the 100 kids face their own challenges after discovering the Earth is indeed habitable. It turns into a veritable Lord of the Flies scenario as Bellamy (Bob Morley) is the evil one looking to assert his power over the children and impose a system of lawlessness. Meanwhile, Clarke (Eliza Taylor) and Wells (Eli Goree) try to maintain law and order and re-establish communications with the Ark after a malfunction destroyed the radios during descent. Pretty soon after landing they also discover that human life continued to exist after the bombs dropped and the Grounders (the name for the “savages”, i.e. non-Ark people) are not too happy about the sudden appearance of new life. Both settings feature storylines that are gripping and keep your interest throughout the season. A few twists were predictable, but most were unexpected to took me completely by surprise. The entire season though held my attention and it felt like I was always right there in the middle of all the action watching events unfold around me, rather than taking a seat on the sidelines and passively observing. The biggest difference between The 100 and Battlestar Galactica is also the biggest downside at times (though can be quite appealing at others). Battlestar Galactica feels like a traditional, well put-together, drama/science-fiction show. The 100 feels much more geared towards a younger, Tumblr-esque audience mired in their fandoms and ships. The dialogue and reactions can be way over-the-top and so inane that it takes you out of the otherwise engrossing story. This being said, there’s also an endearing quality about it as well that pulls you deeper into the show. You can’t help but shake you head while you are simultaneously mesmerized by everything else that’s happening on the screen. 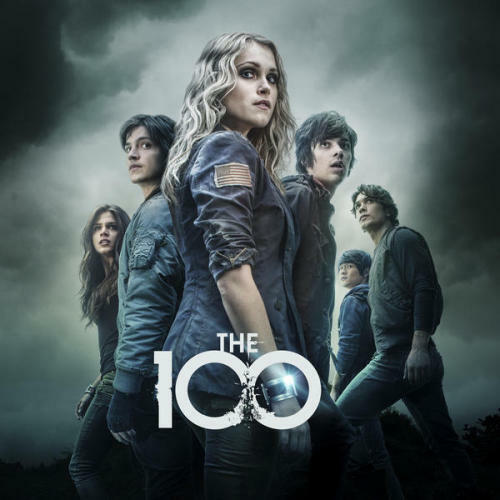 THE TAKEAWAY: For any sci-fi fans, fans of the great Battlestar Galactica, or people who enjoy stories about the survival of an incredibly small set of people, The 100 is just the show for you. It draws you in quickly and maintains the throughout all thirteen episodes. Usually I have to give new shows a handful of episodes before I’m all the way in, but with The 100 I was hooked by the end of the pilot. A few elements, like the dialogue, can be distracting at times, but you still get sucked in deeper with the characters, their stories, and the action that unfolds. May we meet again, The 100. I look forward to season two.